Dr. Ahmed Yousef entered the Physical Therapy world after receiving his degree in 1977 from the Physical Therapy School of the Medical College of Cairo University in Egypt. He was the staff physical therapist of Al Azhar University Hospitals in Cairo until he came to the United States in 1982. Responding to the national shortage of physical therapists during the 1980’s, Dr. Yousef was led to the States by an official agent in May 1982. He remembers the very day, when he and his family were picked up by a private jet from Kennedy Airport and flew to Warton, Texas to sign his contract. Dr. Yousef has served the physical therapy profession in many different settings ranging from the rural areas of Tennessee to working as the Director of Physical Therapy at the hospital in Chattanooga, Tennessee. From there he focused his attention on post heart surgery patients in Tupelo, Mississippi. Another opportunity advanced and he cultivated his skills, from the many diverse working environments, to work for home health agencies. His care and attention of patients in a hospital environment was no different from that he strived to provide the patients, who needed help in the comfort of their homes. 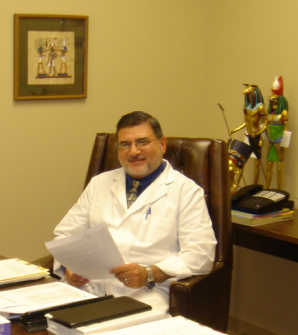 From 1987-1991, Dr. Yousef directed the physical therapy services in nine nursing homes throughout middle Georgia while establishing his own Physical Therapy out-patient clinic. Macon Physical Therapy has become his full time commitment since the year 1991. Helping clients with spine, extremities, temporomandibular joint pain disorders and electrical testing to the integration of muscle and nerve functions (Electromyography and nerve conductions study) are only a few of the many medical special interests that Dr Yousef offers. Although many of Dr. Yousef’s professional goals have been met, he states firmly that education is one thing, that nothing can replace and one can never have too much of. Dr Yousef quite often finds himself back in a class room setting, not only in pursuit of knowledge but also to give his patients the best care possible. Through his dedication and hard work to his profession and patients he maintains serving middle Georgia through his offices at both locations, Macon and Warner Robins.